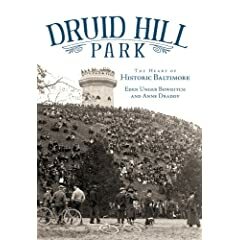 We just finished reading a new book about Baltimore’s first large public park, Druid Hill Park. Many may not have heard of this 745-acre greensward just north of the city’s downtown. In Druid Hill Park: the heart of historic Baltimore, authors Eden Unger Bowditch and Anne Draddy give great insight into how cities and their political leaders once strived to provide beautiful pleasure grounds for their residents. Having a great park put cities on the map. After years of urban decline and residents moving to suburbs, several features and buildings in the park have suffered drastic decay, sometimes to the point that they were demolished or closed to the public. Reading about these structures and thinking about their current state brings both a feeling of nostalgia and demoralization. One of the most striking examples is the Grand Promenade (sometimes called “the Mall” or “yellow brick road” for its paving scheme). The quarter-mile allée was once lined with trees and benches that led to a Turkish-style Music Pavilion and hosted the park’s one-time band, other concerts and was demolished in 1961. Today the walkway has been relegated to serving as a back alley and parking area for the adjacent Conservatory. The bright side is that the brick-paved mall still exists, and presents an amazing opportunity for further park revitalization as the city slowly works to rebuild itself. The park director’s mansion is also mentioned in the book. The house that sits on the very edge of the park has all but fallen into the ground after years of neglect. Amazingly though, in a true sign that the park is on the mend, the Baltimore Parks & People Foundation is raising funds to create a nature center and move its offices to what will be remarkable renovation. The history of this public place also shows the country’s trek through segregation and civil rights. For years, a “colored only” pool separated whites and blacks. Today the pool is filled with earth, its water now only imagined through the green grass gracing the surface. Druid Hill is not only a treasure of Baltimore, but a true gem of an American urban park. It seems to reflect the history of Baltimore itself — its growth, its struggles with race, its decline and today, its slow and winding path toward revitalization. Let’s hope that the latter continues to make the park a greater natural and public place for the city.